For more than 100 years, China’s tiny cultural elite has wrestled with the role of Christianity in society. Traditional scholars educated a century ago in state-sponsored Confucianism tended to reject Christianity as a foreign teaching. But the new professionals of the 1910s and ’20s, as well as the growing middle class in the last 20 years, have been attracted to Christianity as a way to build a strong modern China. Their initial question is often “What can Christianity do for China?” For some, this utilitarian approach becomes a personal spiritual journey. The pattern has been a tidal wave of interest in times of political upheaval, followed by a low tide, often due to anti-Western nationalism. The third of these high tides is surging in Chinese society today. One hundred years ago, scholar-officials lost hope for reviving the Qing dynasty. Since China had to compete with the West on its own terms to survive as a nation, families began to send their children to Western-style, often Christian, schools in China and the U.S. The modern education offered English, science, and new professions such as medicine, law and journalism. A Christian moral curriculum was often an intrinsic part of the package. The YMCA brought in Western lecturers on science and social issues, attracting the general public as well as students. Christian voluntary associations led movements against social evils like foot binding and the opium trade and offered social services to poor farmers and migrant workers. T. M. Fan, a Chinese reformer, was the editor of popular Christian magazines that promoted character building and public morality. The 1911 Revolution, which established the Republic of China, was led by a Western-educated Christian medical doctor, Sun Yat-sen. He is honored today as the “father of the nation.” Despite the turbulent years that followed, civil society flowered, and Christianity was part of a worldwide wave of optimistic faith in gradual human progress through education, citizenship, and social reforms. Such hopes receded after Chinese national interests were betrayed at the end of World War I, when the West ceded some of China's territory to Japan’s control. In 1922, Communists and anarchists protested the Conference of World Student Christian Federations in Beijing. After three other anti-Christian movements, many missionaries left China. Revival in wartime universities Christianity next spread rapidly among educated Chinese during the civil war of 1945-49. China Inter-Varsity Evangelical Christian Students Fellowship (IV-China) was inaugurated in July 1945 at a summer conference in Chongqing, the wartime capital. There were 160 students representing 40 of China's 60 universities present. Calvin Chao (Zhao Junying), the general secretary of IV-China, held powerful evangelistic campaigns in Chengdu, Sichuan province, the home of two great universities and the wartime refuge for five others. 168 students became Christians in four days. Their hearts and minds were open after living as refugees and seeing the desperate poverty in the mountains of southwestern China. In July 1947, 350 students from every Chinese university gathered for an IV conference outside of Nanjing. Chao opened with a reminder that Christians must prepare to be persecuted for the name of Jesus. Closing testimonies sparked a revival among the students. Despite the growing political tensions, student work continued on almost 80 campuses, with Bible classes, retreats, and radio broadcasts. Teaching focused on 1 Peter, which had prepared the first-century church for persecution, and on prayer. The Nationalists were suspicious that IV-China was hiding Communists among its members, and the Communists wanted to crush the students’ allegiance to Christ. Campus workers sponsored the first (and last) city-wide evangelistic campaign in Beijing in the summer of 1948 and established soup kitchens and outreach in the city’s refugee camps. After the Communist takeover in 1949, faculty, staff, and students had to attend political study groups. Yet students were able to keep holding prayer meetings and conferences until 1955, when silence fell. The series of political campaigns culminating in the Cultural Revolution targeted the elite classes, trying to break their allegiances to the West. From 1966 to 1976, all schools were closed, and professors and students were sent to the countryside to learn from the peasants. 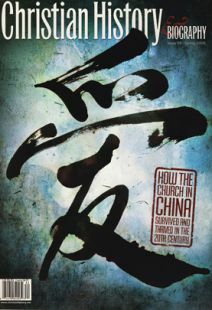 When schools and churches began to reopen in 1978-1979, many Chinese thanked the missionaries who had helped them prepare for persecution: “What you did for us in Peking [Beijing] was exactly right for us young Chinese Christians at that time.” One medical student, who had maintained a steady witness despite 12 years in prison, became a cancer researcher and leader of numerous house churches. Professor Feng Xizhang, a prominent U.S.-trained nuclear physicist, resurfaced in retirement to lead Bible classes in the university district church, mentoring the next generation of lay leaders. By 1980, official education exchanges restarted. Older scholars went abroad at first, followed by graduate students, until nearly 100,000 were overseas in any given year. Fascination with the West prompted curiosity about its cultural roots in Christianity. After attending a church service in Cambridge, England in 1979, the astrophysicist Fang Lizhi wrote, “Chinese intellectuals know something about the Renaissance, but very little about the Reformation. – The Reformation was certainly no less influential than the Renaissance, and in fact the two are inseparably linked.” A decade later, Fang sought refuge in the American embassy in Beijing after being blamed for instigating the Democracy Movement—a series of mass protests led by students and intellectuals calling for government reform. On June 4, 1989, the Chinese army crushed the demonstration in Tiananmen Square, killing hundreds of young people and arresting many. This violence, followed by the collapse of European Communism in 1990–1991, dashed many people's hopes for gradual democratic reform. They began to take Christian teaching more seriously since it offered a realistic understanding of sin. “Christianity fever” spread rapidly. Western teachers of English in China played a major role in demonstrating and explaining the power of self-giving love. Before the June Fourth tragedy, Chinese scholars and students in North America had begun to attend English classes, potlucks, and Bible studies hosted by campus ministry workers. However, many carried deep scars from the Maoist past and were loath to trust any doctrine again. They also knew that their actions were being monitored and might be used against them when they returned to China. But after 1989, many more Chinese abroad became Christians. Magazines in Chinese for both seekers (Overseas Campus) and believers (Christian Life Quarterly) offered convincing testimonies. One Chinese scholar wrote, “I personally believe that China would have no future without embracing Christianity.” Over time, Chinese graduates who stayed in the U.S. as young working professionals formed their own churches. A number of pro-democracy activists who escaped China in 1989 became Christians. Yuan Zhiming wrote how shocked he was to experience the fierce infighting for power and fame among his pro-democracy comrades, and also to discover that their idealized Western society was flawed. Yuan experienced unconditional love for the first time in a Princeton Bible study group. He was baptized and entered seminary. He concluded that economic modernization and democratic institutions were useless without personal rebirth and a transcendent faith in God's ultimate authority. To this end, Yuan has produced a series of powerful films that are reaching thousands of Chinese for Christ. By the late 1990s, Protestantism was growing faster in China than any other belief system. Urban house churches, spawned by groups that proliferated on campuses through the 1990s, provide a support system for young professionals and their families as well as returned scholars. Though these Christian groups are not registered with the government, they meet in apartments, rent commercial space for special events, and are trained through Chinese language seminaries throughout the Asia-Pacific. They participate in the burgeoning “virtual community” of Christian websites, databases, blogs, online counseling, and prayer chat rooms. Christianity is touching all sectors and levels of society. University humanities departments have generated nearly 100 religious study centers, and conferences and field research have begun to explore the relations between faith and economics, or religion and law. Some faculty members have become “hidden” Christians, who like other state employees cannot yet risk being baptized or attending church. Chinese Christian writers and artists are beginning to compose their own novels, poetry, music, and drama. Both of the founders of the China branch of PEN, the international writers’ association, are Christians. One prominent journalist and social critic is no longer surprised when her friends announce, “Wo xin jiao,” literally meaning “I’m a religious believer”—everyone knows this means they are new Christians. A growing number of new Protestants are surfacing in the legal profession. They want to build a legal culture through public education and pursuit of justice in the courts. Many are inspired by Martin Luther King’s Christian principles of nonviolent resistance. Even business professionals are sharing their testimonies in glossy business magazines in China. Mr. Cao is one of several self-made millionaires who have found a new identity and hope in Christ and who now fund health and education projects for the rural poor. Carol Lee Hamrin is a Chinese affairs consultant, research professor at George Mason University, and senior associate with the Global China Center (GCC) in Charlottesville, Virginia. Stacey Bieler is a GCC Research Associate. During the Golden Age of Chinese Protestantism (1900-25), many Chinese Christians studied in the U.S. and returned to serve their country. Mary Stone, James Yen, and Yifang Wu were three pioneers who sowed seeds of today's revival and offer models for educated urban Christians. Nothing was ordinary about Mary Stone's life. Her parents were among the first Christian converts in central China; her father was a Methodist pastor (martyred during the Boxer Rebellion) and her mother the principal of a Methodist girls' school. Mary was one of the first girls whose feet were left unbound despite the risk to her marriage prospects. She and her friend Ida Kahn became two of the first three Chinese women to obtain a medical degree in the U.S. She also became the first Chinese woman ordained in central China. When Mary and Ida returned to China in 1896, they set up a mission clinic and nurses' training center in the Yangzi River port of Jiujiang. Within months they were overwhelmed by the demand. At times they treated 5,000 patients per month. "Although we were so rushed that we did not even sit together to eat our regular meals," Mary wrote in a letter, "yet we felt it was the happiest Christmas we have ever had." Mary served the mission hospital for 25 years, first with Ida and then with American missionary Jennie Hughes, with whom she adopted four orphans and gave foster care to others. Whole families and villages became Christian as a result of her ministry. She was known for her radiant smile. In the 1920s, Mary and Jennie resigned from the Methodist Women's Foreign Missionary Society because they objected to modernist trends in doctrine, which Mary called the "rice Christianity" of social action without faith. They launched the nondenominational Shanghai Bethel Mission to reflect their "old fashioned faith." Their work grew to include not only a church and the Bible college run by Jennie, but also Mary's hospital and China's largest nursing school, primary and secondary schools, a clinic for poor migrant workers in Shanghai's industrial area, and eventually several homes for war orphans. Dr. Mary Stone can be given much credit for the revivals of the 1930s and 1940s that built up the independent Chinese church and sustained it through decades of war and revolution. The Bethel evangelistic bands traversed the nation. After the Japanese attack in 1937 destroyed the Shanghai compound, Mary set up a base in Pasadena, California, to raise money to support Bethel Mission in Hong Kong. In the post-Mao era, the Chinese Christian leaders her mission trained have gone back to China, providing teaching and financial support for the massive revival of today's church. Yen returned to China in 1920 and started the Mass Education Movement (MEM), recruiting volunteer teachers and using a set of four readers with 1,000 Chinese characters. The YMCA and YWCA eagerly used the new resource, and the MEM spread. James and his wife Alice, who was born and educated in the U.S, wanted their lives to reflect John 1:14: “The word became flesh and made his dwelling among us.” So they left the big city to live in the poverty-stricken countryside in Dingxian, a county of 400 villages north of Beijing. They wanted to address all four interlocking problems of village life: illiteracy, disease, poverty, and misgovernment. Yen convinced American-trained Chinese graduates in agriculture, education, drama, medicine, and political science to live and work in the primitive conditions of Dingxian. This living example of humble service was contagious. In 1933, 180 delegates from 14 provinces came there for a National Christian Rural Reconstruction Seminar. During the Japanese occupation, the MEM opened the National College of Rural Reconstruction near Chongqing, the wartime capital of Free China during the Japanese occupation. In 1943, Yen was honored at Carnegie Hall on the 400th anniversary of the death of Copernicus, along with nine other “modern revolutionaries” including Albert Einstein, Orville Wright, Walt Disney, and Henry Ford. After the Communist victory in 1949, James moved to New York and then started rural work in the Philippines. In 1960, he founded the International Institute of Rural Reconstruction (IIRR) and spent the next 30 years improving the lives of thousands of poor farm families in the Philippines, Africa, Central America, and Southeast Asia. Recently James Yen was honored on Chinese television as one of the outstanding Chinese leaders of the 20th century, and books on his approaches to development have been published. Today, IIRR is working in Yunnan, one of China's poorest provinces. Yifang Wu graduated as student president of the first class of Jinling College for Women in Nanjing, the first and largest college for women in China. She had became a Christian there after a family financial crisis and several suicides left her alone in the world. Wu later recalled how a Christian classmate's “loving sympathy for me uplifted me out of self-imposed isolation . . . Gradually I understood the real meaning of life and learned to aim at a worthy life purpose.” She and her classmates helped choose the school's motto, “Abundant Life” (from John 10:10), which she made her own. the first Chinese woman to hold a college presidency. In the 1930s and 1940s, Wu became involved in national and international circles, working on war relief with Mme. Chiang Kai-shek, and meeting reformer Jane Addams and First Lady Eleanor Roosevelt. She served twice as president of the National Christian Council. As the only woman on a senior government advisory committee, she inspired women nationwide with a living example of capability, humility, and compassion. In 1945, Wu was the only woman in the Chinese delegation helping to draft the U.N. Charter, and the first woman to sign it.